Rumor Addicts: Sonic Colors to feature 2-Player mode? I’m super excited for Sonic Colors. I even have both versions preordered so I can get two hats. These new screens found on Amazon both make me more and less hyped for the game. 2-player, simultaneous multiplayer would be fantastic. I loved how it was done in Sonic Adventure 2 and was kind of hoping we’d see more of it in the new game. But, a recolored Sonic? Again? I really hope that’s some kind of gametesting placeholder. I’d take Shadow again over another Sonic recolor. And I’m sure this is some weird, physics testing level but it looks like it would be pretty rad to run through. Maybe it’s some VR-ride in Robotnik’s theme park. Sega Addicts After Hours Episode 05: What if Tails never existed? I would be so happy. 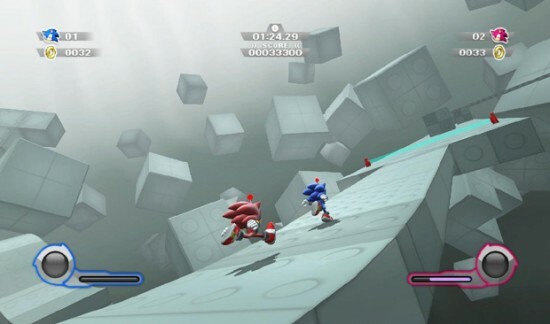 2 players simultaneously in a 3D Sonic sounds… well, actually like a recipe for disaster, but I still want it to happen! It does look like it could be a placeholder. The last thing they need to do is legitimize all those recolors that are floating through cyberspace. Also, Tails would be an obvious choice for a 2 player mode. I hope that stage is real. I’ve come to really like abstract platforming stages. There’s something appealing about how they strip away all the gloss and imagery to reveal the raw elements and challenges of the game. It’s also a great test for just how high quality your game engine really is. @Josh, yeah it reminds me of those special stages in Mario Sunshine which were exactly what you described. Platforming at its essence. I do hope that the recolour is a placeholder. The two player mode could be interesting, but I doubt it will have much lasting appeal. Galaxy was the exact game I had in mind.